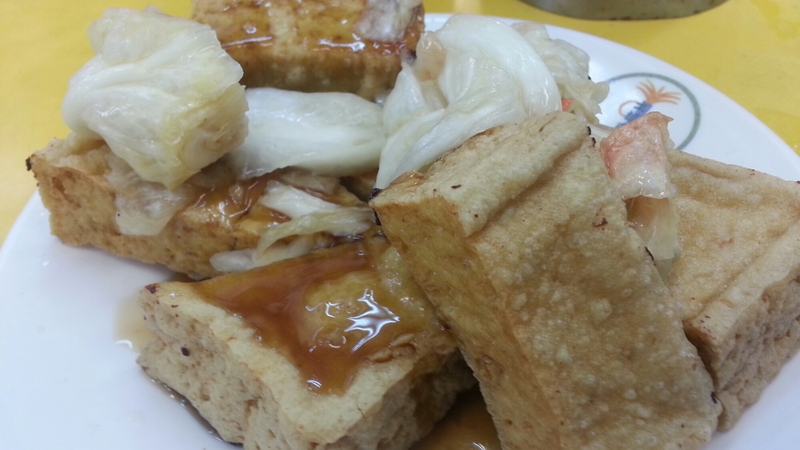 I’ve been back from Taipei for almost a week now and I already miss my usual Taiwanese breakfast chow. Oatmeal, even with peanut butter, just doesn’t compare. 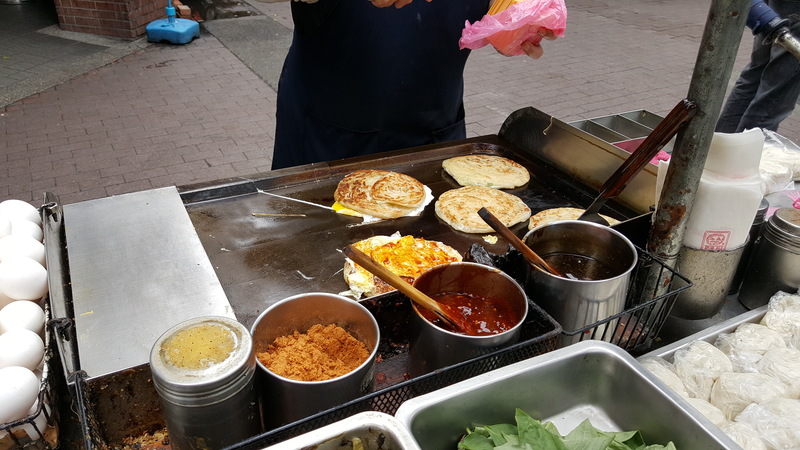 One lives for Taiwanese breakfasts (well…aside from the night markets). 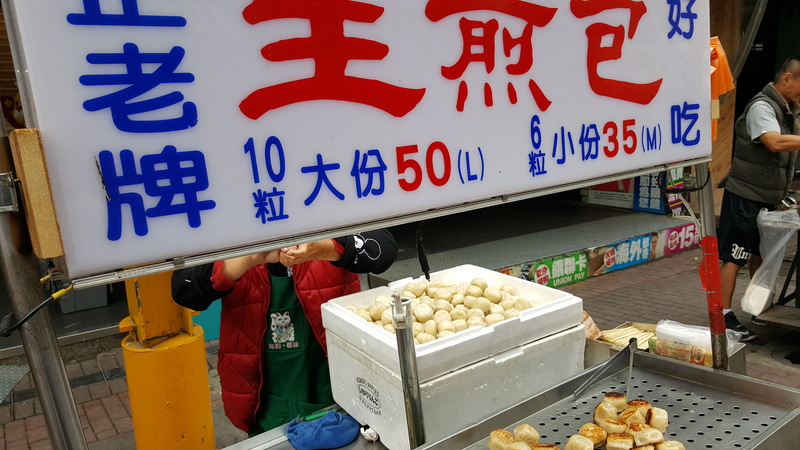 They’re tasty and cheap and you can find them everywhere including Ximending, my favorite area to stay whenever I’m in Taipei because of its energy. 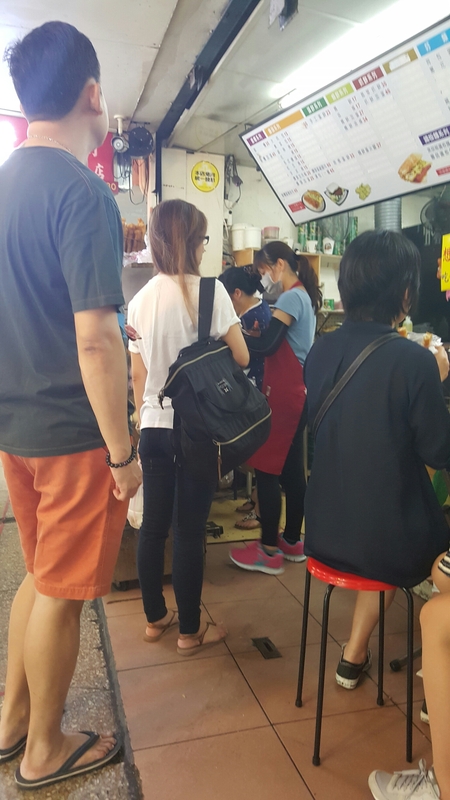 While the rest of the establishments are still asleep (except for a few cinemas), the hawker stalls are all awake and alive. 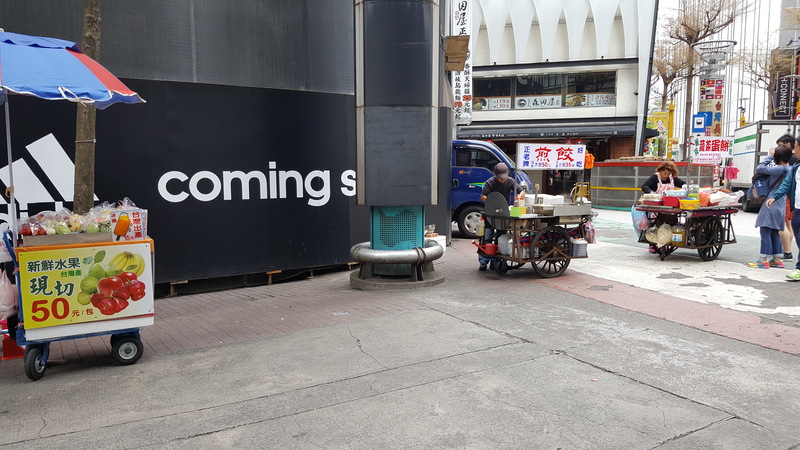 You can always brave the lines at nearby Fu Hang Dou Jiang (and you should, at least once because aside from the good eats you are well… a tourist.. and that’s what tourists do.. eat at rated places) but if you want a little more variety, head to this section of Ximending. 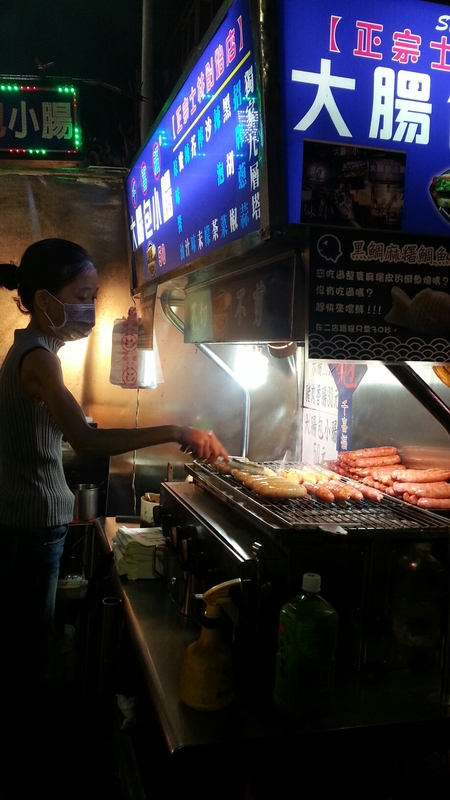 These stalls have never failed me in all those times I was in Taipei. 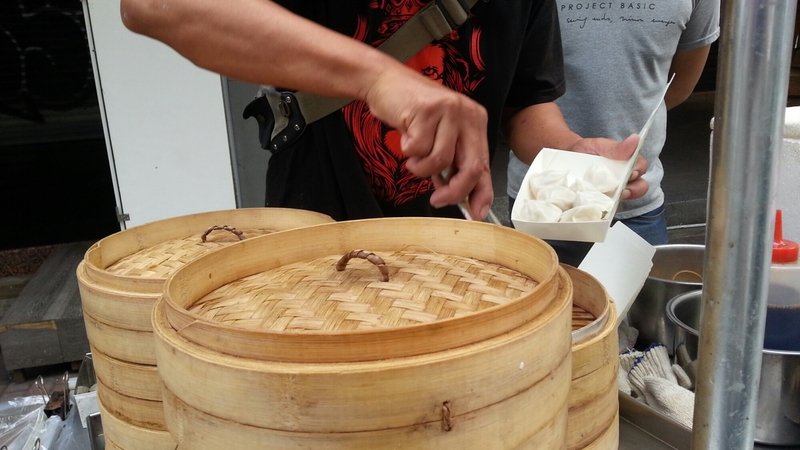 Have you had enough of xiao long bao? 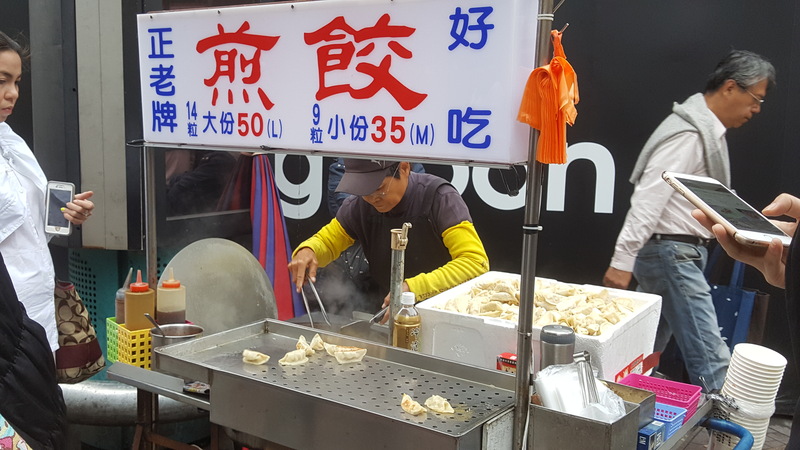 Then try these two stalls that sell pan-fried dumplings for a different experience. There are round ones . . . I really can’t say which I like more as they both have different flavors and textures. Why stress yourself out? Have both! Douse them with soy sauce and some chili! Really really good! 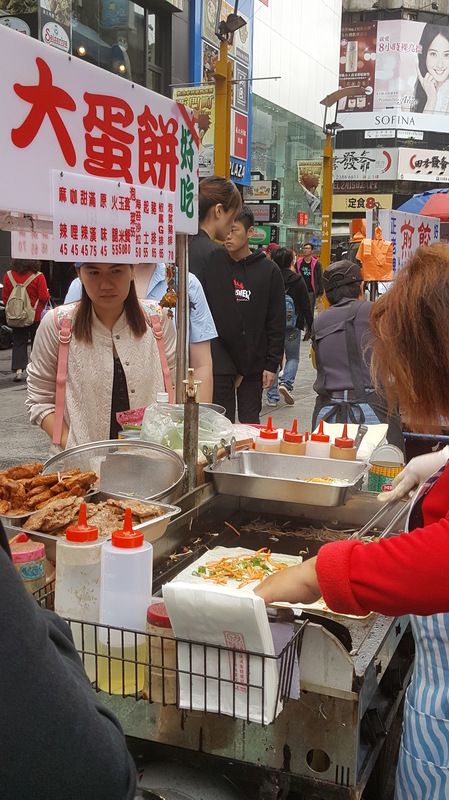 For something heavier, there are stalls that dish out Taiwanese “pancakes” which you can have plain or with egg, bacon, ham, pork fillet, and other stuff. Obviously, you have to go to one of the steel benches around the area to enjoy your breakfast. Bring some baby wipes too to clean your sticky hands. There are 7-11s where you can get a drink and some good coffee. 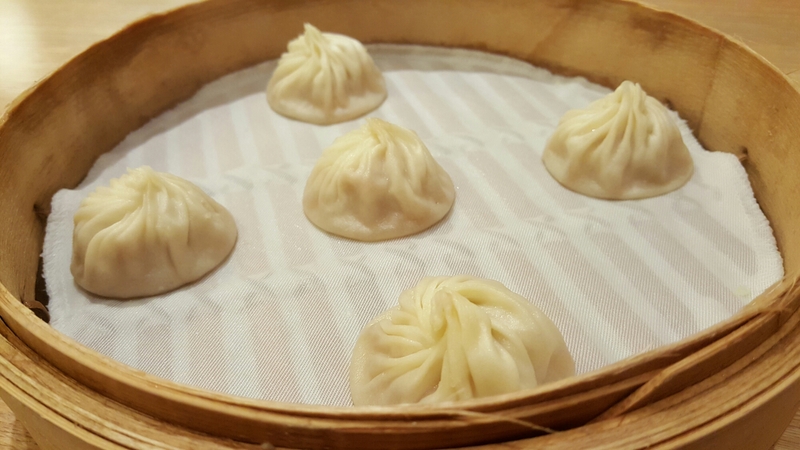 After my successful conquest of the famed pepper buns at the Raohe market, I set my sites on another goal— dining at the original Din Tai Fung at Xinyi Road. 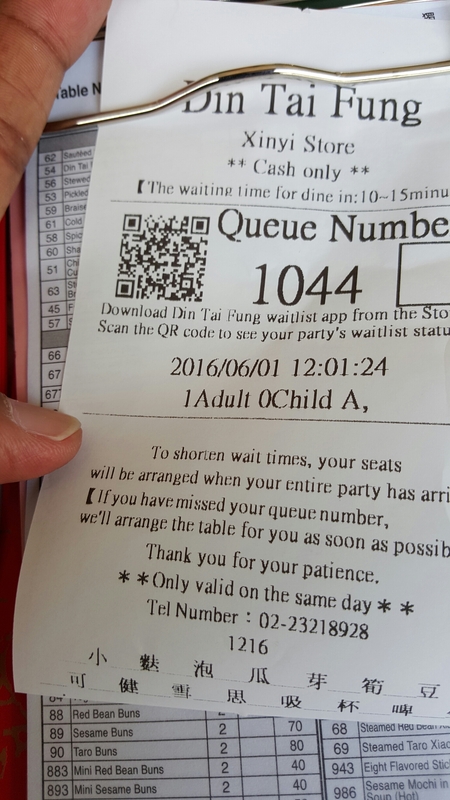 I was frustrated during my three previous trips to Taipei due to the long lines. Sure, a branch has opened in Manila but one gotta have the original at its birthplace. I arrived at 12:30 and surprise, there wasn’t much of a crowd. 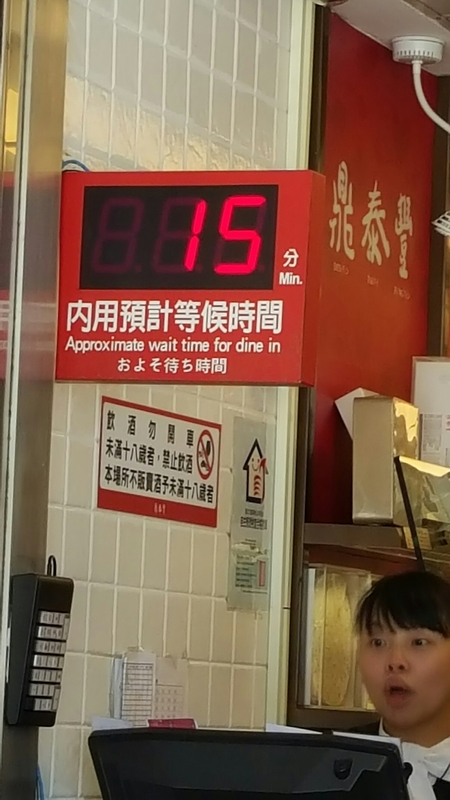 According to the timer, there was only a 15-minute waiting time. I took a number at the reception and waited. Alice, the girl who registered me was very nice and on hearing that I was from the PH mentioned there was a branch there already. She handed me a picture menu and an order slip in English. My number appeared on the electronic board in ten minutes and I was told to go up to the second floor where I was led to a table. It was all so very efficient and quick. I have not tried the Manila branch so I can’t compare. The food arrived quickly. The pork siolongbao was very delicate. I wish ordered 8 pieces instead of 5. 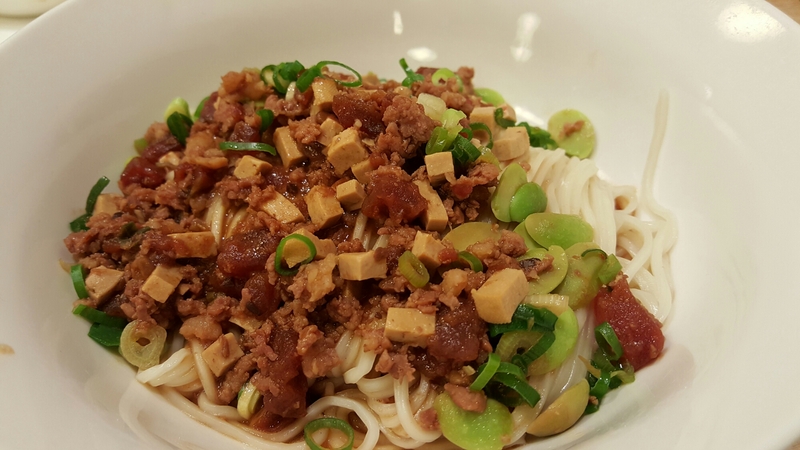 The noodles with minced pork was very tasty as it seemed to have chopped char-siu. 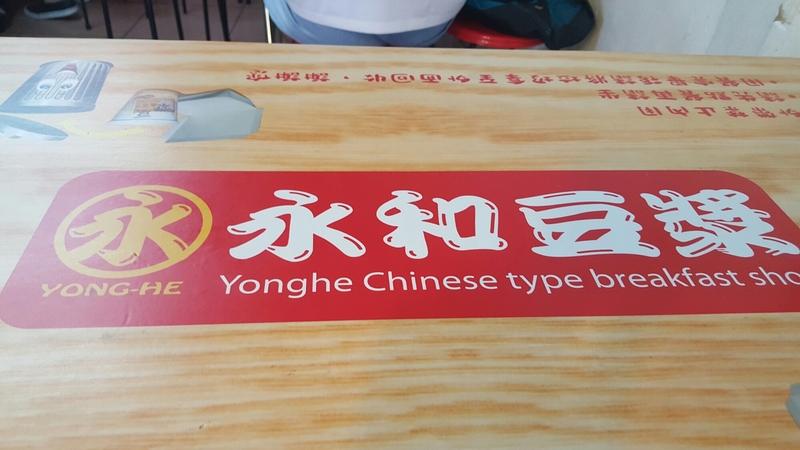 I also liked the chewiness of the noodles, a sign of it being hand-made. 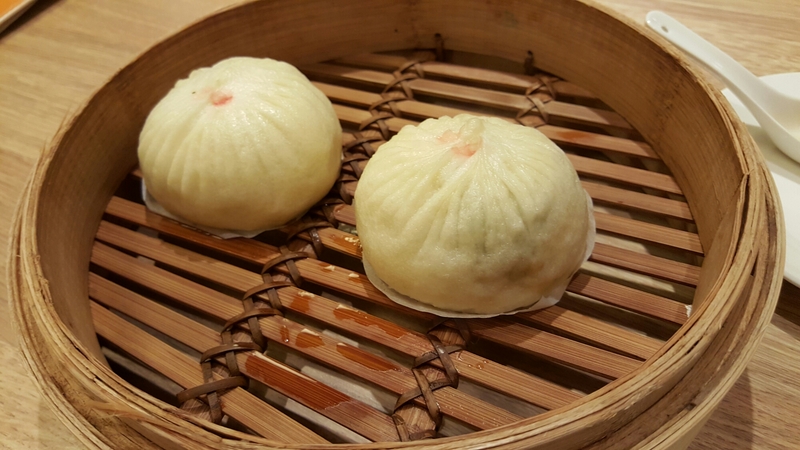 Wanting to try a different kind of steamed bun, I ordered the vegetable and pork bun which arrived steaming hot. The dough was soft and had just the right amount of thickness. Just as enjoyable as my meal was the friendly and professional service. Everything was served with a smile. 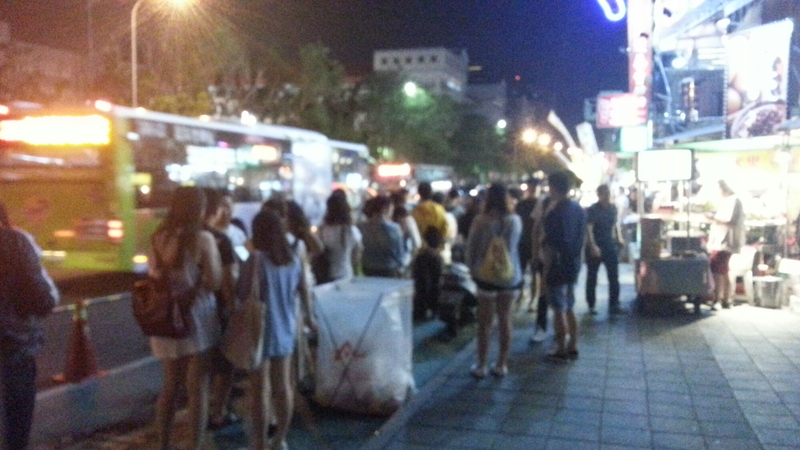 When I left the restaurant, there was a large crowd outside already. 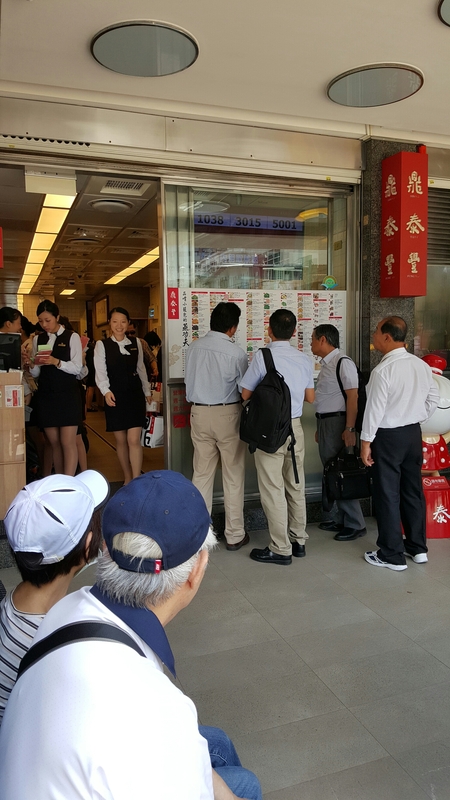 It took several tries and four trips to Taipei before I finally got a seat in this super famous shack of a breakfast shop in the Ximen area just across East Dragon Hotel. 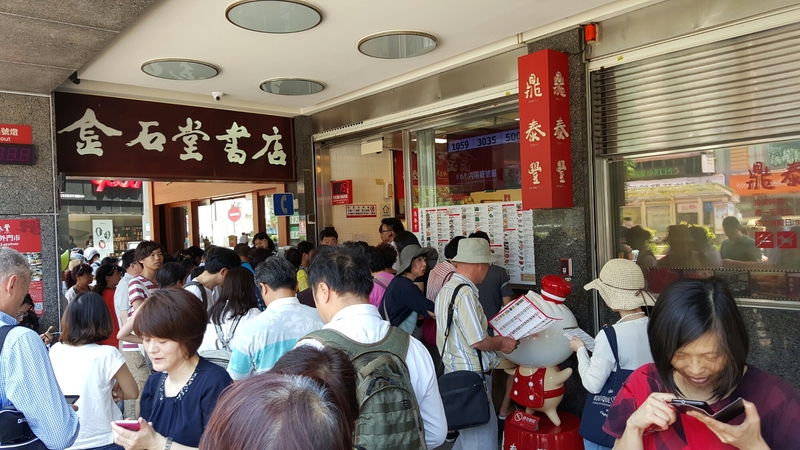 In an earlier trip, I used to stay at Easy Stay Ximen just a few doors down and everyday there would be hordes of people lining-up for fried dough sticks, salty soya milk, traditional sandwiches and dumplings. 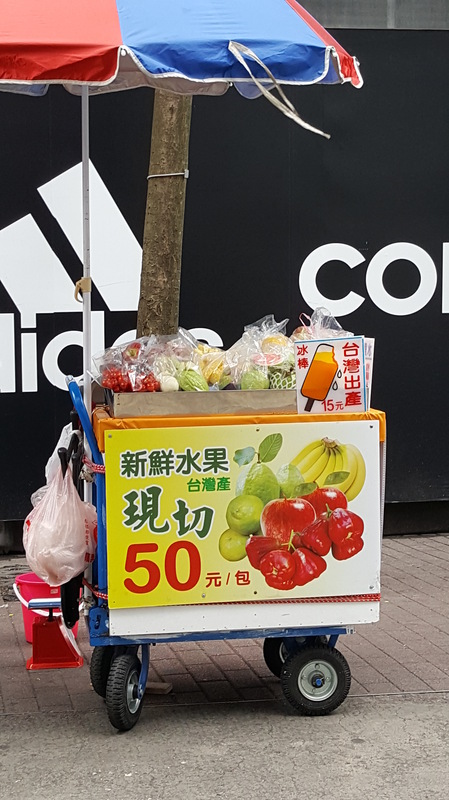 With no English spoken, I was too timid to try. But today, there was no line (maybe coz it was close to 9 already) and there were vacant tables! 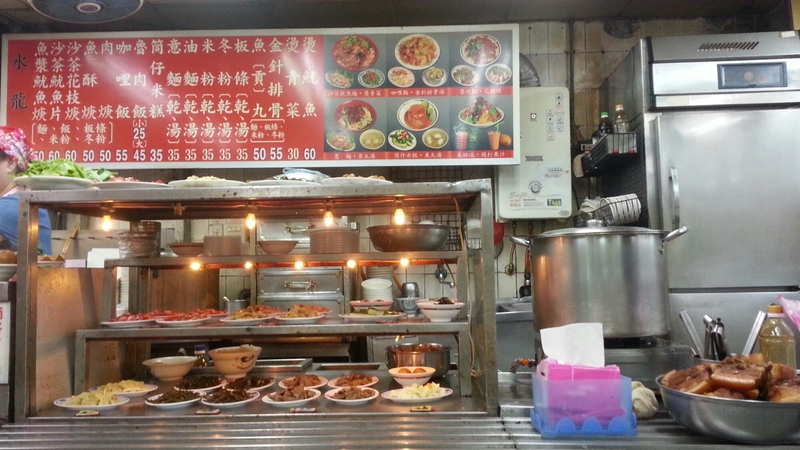 I also saw a picture menu and simly pointed to a chicken chop in a mantou bun! I grabbed a table by the sidewalk and settled-in which was just as well as people suddenly appeared and there was a line. My freshly-made sandwich arrived piping hot. 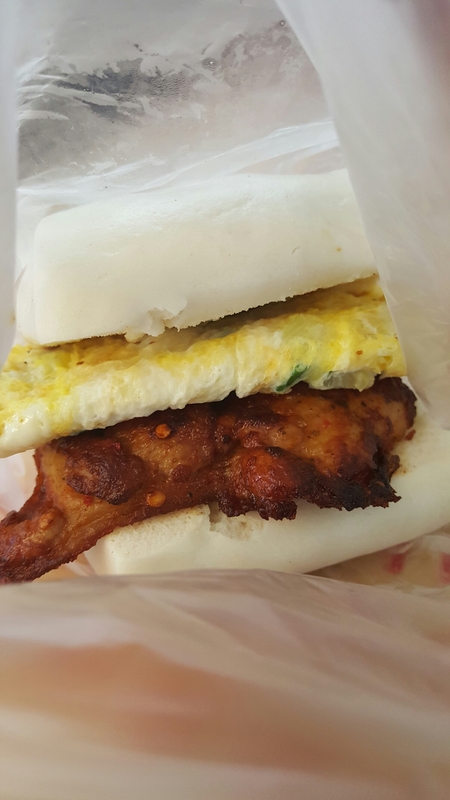 The mantou bun was pillow soft and the chicken chop tender. Filling and cheap (NT60)! Good morning! 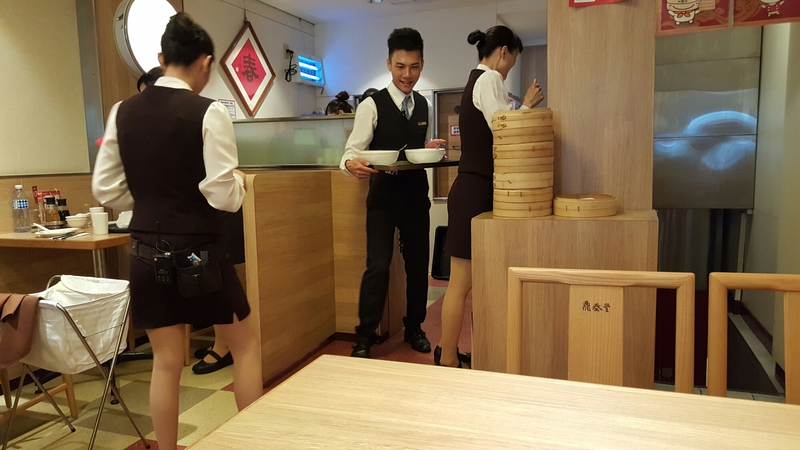 Yes, you can head to Michelin-starred Din Tai Fung for a proper meal in air-conditioned comfort but that ain’t fun. 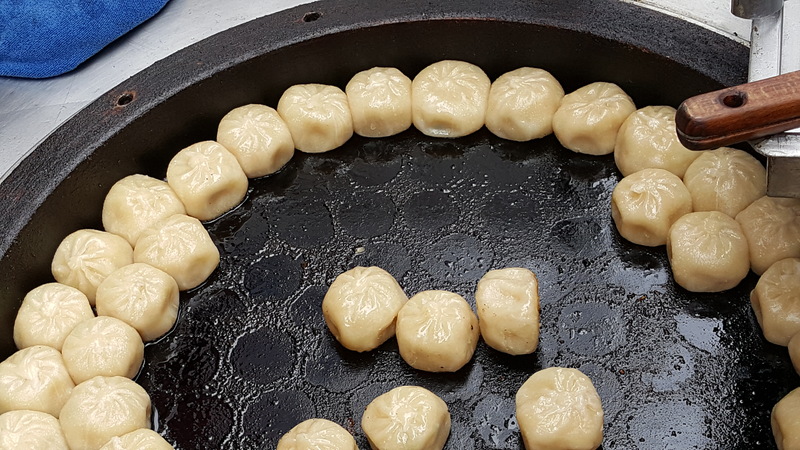 The best eats are on the streets and you don’t have to go to a night market for that. 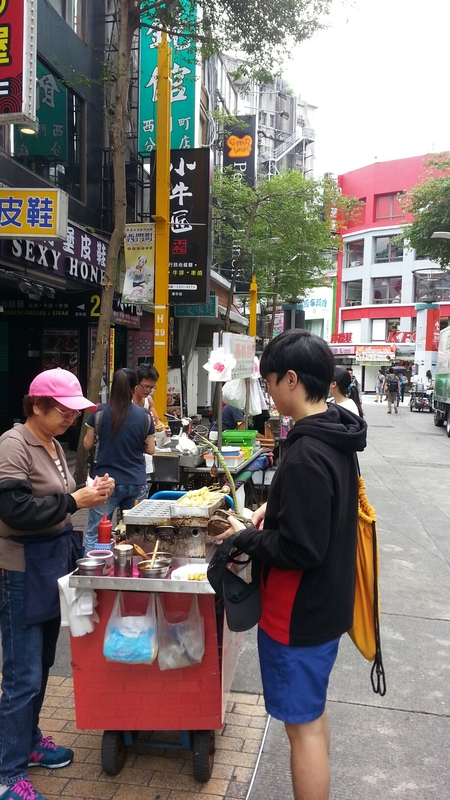 Wherever you’re staying, there’s bound to be a stall or a rice and noodle shop somewhere. 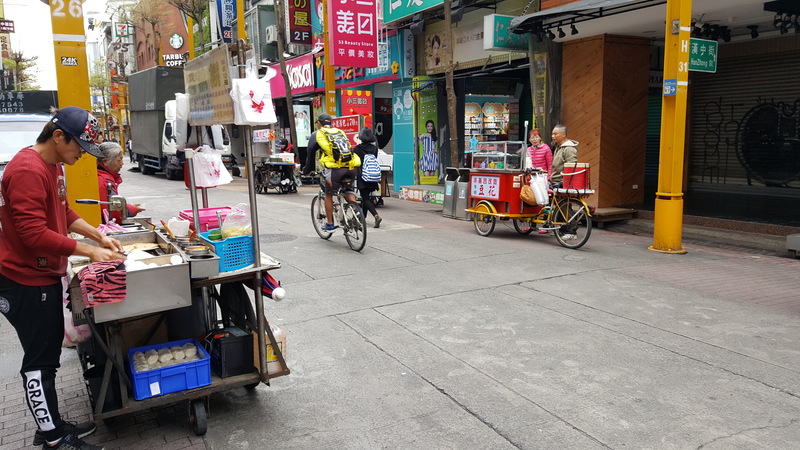 My hostel was at Ximen, walking distance to the pedestrian street where vendors converge all day. Easy to get breakfast, especially. 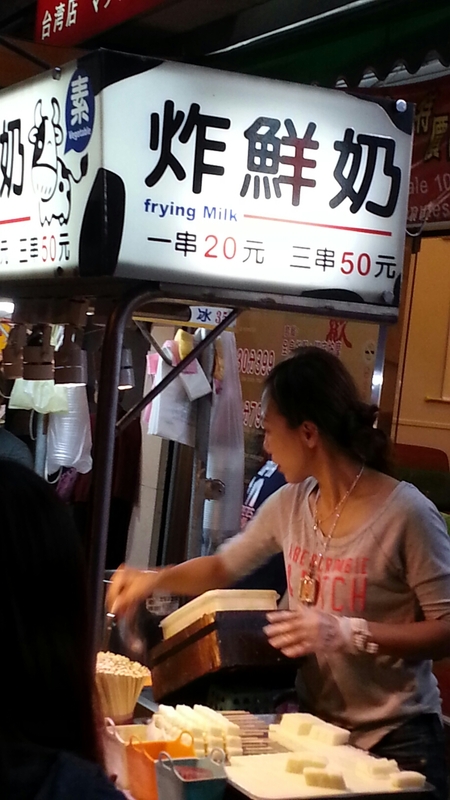 Most stalls don’t have English menus. Just simply point at the pictures or see what’s cooking. Often, you will be asked, “Spicy?” Say “Yes!” so you can get the full flavourd of what you’re eating even if it’s just a large fried chicken filet. Follow the lines. 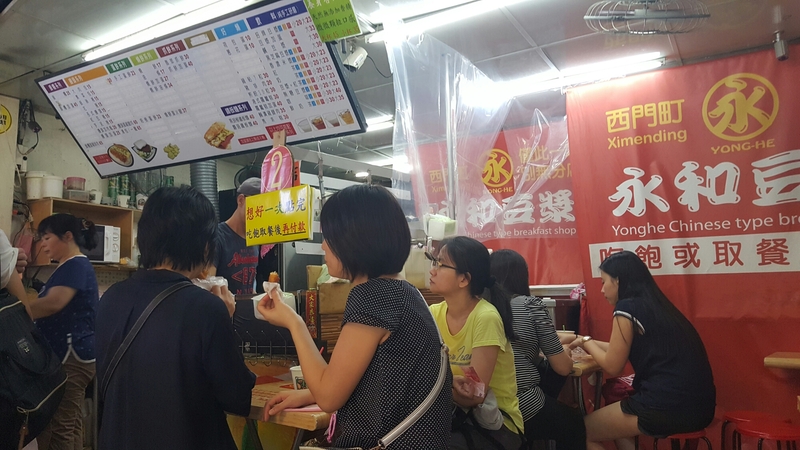 This fried chicken stall is at the street corner of Shilin and locals line-up for its crisp meat and savoury taste ($70). 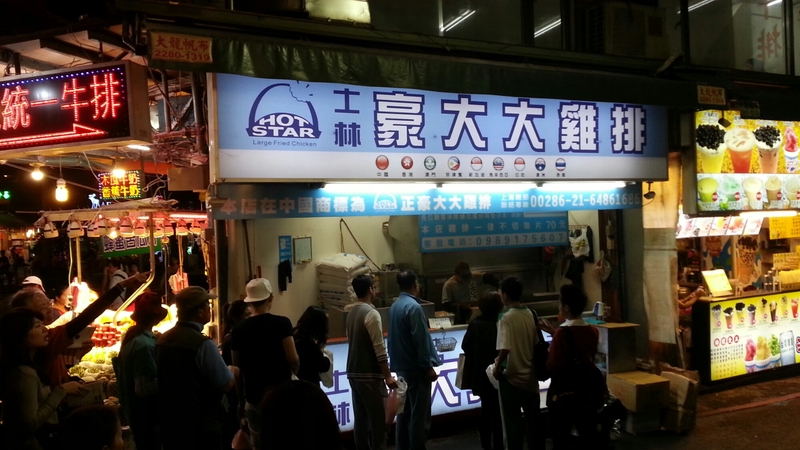 Hot Star, the most popular fried chicken franchise has its own lines too. 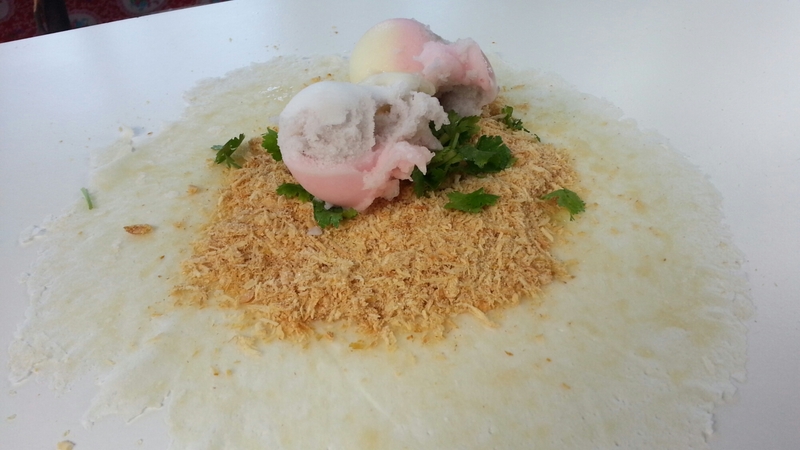 Wansuy on ice-cream seems strange but it’s delicious! 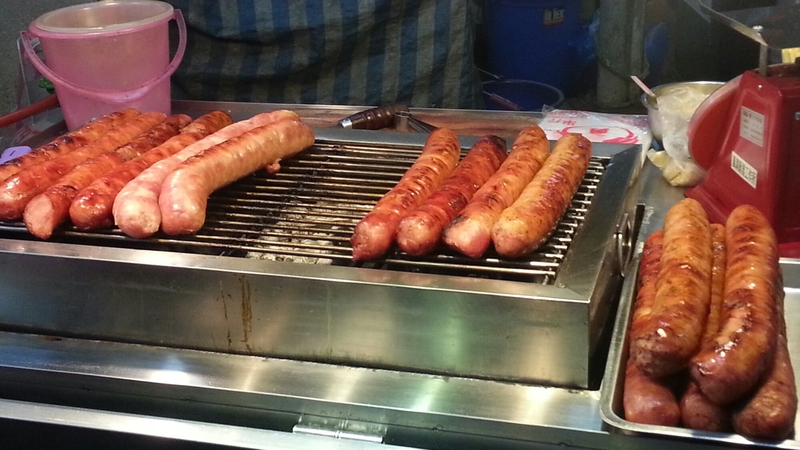 One cannot get enough of those delicious Taiwanese sausages. I bought 3 packs at Carrefour in Ximen to take back home. I booked my Taipei flight as soon as the APEC holiday was announced in July. Fortunately, out of more than a thousand flights that were canceled due to the no-fly zone, mine wasn’t. Getting to the airport was the bigger challenge due to the horrific traffic. 3.5 hours since leaving the house, the cab was still stuck in traffic at Lawton Ave. somewhere in Fort Bonifacio. With 2 hours to spare, I decided to just walk the remaining 2 plus kilometers to NAIA 3 along with others lugging their cling-wrapped luggages. Took me 30 mins and a soaked shirt. Got my luggage safely through security (no “tanim bala” here) and changed into a new shirt. The flight was delayed due to the late arrival of the aircraft which meant arriving in Taipei past 1 am. Managed to snag an empty couch at the departure area but couldn’t sleep much as it was quite noisy due to departing guests. Woke-up at around 5 as people were arriving to check-in. Moved to the 3rd floor where there were empty couches with charging stations! At 6, finally decided to get-up and go down to the bus departure area for the ride to Taipei Main Station.